CoQ10 belongs to a group of substances known as ubiquinones. These molecules are known to have cardioprotective, cytoprotective, and neuroprotective properties. Purchase this product now and earn 14,415 Reward Points! CoQ10 belongs to a group of substances known as ubiquinones. These molecules are known to have cardioprotective, cytoprotective, and neuroprotective properties. The antioxidant characteristic of CoQ10 works in the mitochondria—the power plants—and in the membranes of cells, where it prevents oxidation. It also inhibits the oxidation of LDL cholesterol, which plays a significant role in atherosclerosis. CoQ10 is made by the body and shares a common pathway with cholesterol. Levels of CoQ10 decline as humans age. Additionally, some drugs, such as the statins used to control cholesterol levels, inhibit the body’s manufacture of the enzyme. Absorption of CoQ10 is relatively low, especially if a supplement is taken on an empty stomach. For that reason it is best taken with food, preferably containing some fat. Normally, it takes several weeks of CoQ10 supplementation to reach maximal serum concentrations. Thereafter, daily dosing will maintain the plateau. OTHER INGREDIENTS: Medium chain triglycerides, bone gelatin (bovine), glycerin, purified water, beeswax (yellow), lecithin (soy) and annatto suspension in sunflower oil. SUGGESTED USE: As a dietary supplement, take one softgel per day with water and food or as recommended by your healthcare provider. If you are pregnant or nursing, seek the advice of your physician before using this product. Laboratory analysis guarantees purity of Product. 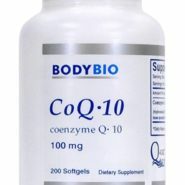 CoQ10 belongs to a family of fat-soluble substances called ubiquinones, all of which are known as coenzymes Q. It is synthesized in humans, where it is used to manufacture ATP, a major form of energy available for immediate use by the body. It also functions as an endogenous (made inside the body) antioxidant, protecting mitochondria from free radical damage. CoQ10 is used to enhance cellular activities that support the cardiovascular system in the treatment of congestive heart failure and hypertension. It also may be indicated to correct reduced levels of CoQ10 that often accompany the use of statin drugs. It appears to be able to recycle vitamin E.
As a dietary supplement, take one softgel daily, or as recommended by your healthcare practitioner. 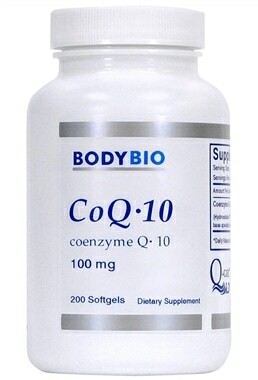 What are the side effects of Coenzyme Q10? In large doses there have been reports of gastric upset. It may decrease the effectiveness of warfarin. Pregnant and lactating women should consult a doctor before using this supplement.